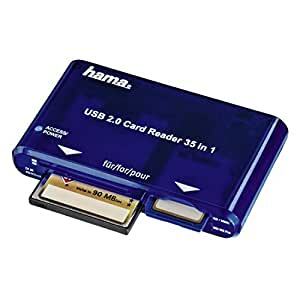 I purchased my original Hama card reader locally while traveling in Warsaw, Poland. The price seemed about right and I was in a foreign country so I went ahead with the purchase. To my surprise, this reader was faster than any other I had used to that point in time. More recently, I was in the market for additional readers for each of my sons. They had been impressed with my Hama reader when they used it. I purchased two additional units on Amazon and they have not disappointed. We use them for photo file transfers from Compact Flash (CF) cards and with over 10,000 files transferred, I have experienced no problems. One other attribute of note is the fact the CF always align properly on the guides and on the pins. My experience with several other card readers has been that they are slower and that the cards do not align properly in the reader without repositioning. Also, the pins in competitive readers have not held up to repeated use- pulling from their seats over time. My original Hama reader is over 5 years old and still works great. Hama is the only replacement I will consider when the time comes! The build quality of this simple card reader is exceptional and Amazon offers it at very attractive pricing. My favorite card reader at a good price and great service.